The first movie was loosely based around much of the first dozen issues as well, minus the mousers and triceratons, etc. Does this mean the new movie will be based on most of the original comics you made with Kevin Eastman, or just the first issue (like the CG straight-to-DVD movie that was discussed), or is it too soon to say? I hope things with NECA get figured out next as they would be perfect for making collectables for this new film. This is a fantastic opportunity. Please, please, push for the real Turtles to be shown to the public. In other words, and while this may read as sensationalist hyperbole, it is more or less my true opinion: No PG-13, no deal. Exciting! And what an artifact to behold- one of the original movie masks. That's great! Also, Peter- I Emailed the FanMail email about visiting Mirage (I'm about to graduate from UMass), so in case things like that have difficulty finding their target I thought I'd mention it here. Can't wait for the next movie! Congratulations Peter! Very much looking forward to seeing what you guys come up with. This rocks so much!!!! Still some exciting times for the Turtles yet! I was a fan of the CGI Turtle movie, but this should bring in a lot more viewers. Sounds like the best of both worlds. This is going to make a lot of people happy. I'm sorry, but that Donny head just looks creapy held that way :). but it does sound pretty cool. So how is it going to be done with Movie 5? The only thing I can think of, is that it'll follow issue one and be a total reboot. Maybe throwing in Issues 2 and 3 for good measure. In the mean time, will talks begin on producing the next TMNT cartoon and straight to DVD projects to promote the upcoming movie? Also, please make sure getting an action/fight choreographer is a high priority for this film. Awesome I have to be a part of this somehow. Peter do you know how is going to be casting the film? I'd be content with just being in the background of some scene. Please let me know! I hope this does things a bit differently. I mean we've already seen the origin so many times already. Can't wait to see who the cast is. It's good news to know that another Ninja Turtles movie is in works but I'm really disappointed that there's no sequel to the CGI TMNT film. I enjoyed it a lot and felt that it's a great film that brings back the green team to the silver screen. I'm not sure what direction the new film is taking but I just feel a bit tired of all the unnecessary reboots for comic book based movies. Pete, I would seriously think about approaching Zack Snyder to direct (300, Watchmen). He has already expressed in a watchmen interview that he is a huge fan of the turtles, and hes done well with comic properties so far. Great fit in my opinion. Great fit in my opinion. -->> ..now i do like that point. Good to hear about the new movie! It will be interesting to see how this one turns out. Peter - I think this is a really good idea as I've already stated the TMNT cgi from a few years ago was lacking in threatening villians and a gritty reboot is required for TMNT. Can't wait to see The Shredder back in action! Overall this news has made my day and I will see the film whether great , good or bad. This is awesome news. I'm so excited about the possibility of a new movie that may actually use puppet suits. I think the Where the Wild Things Are trailer looks awesome, and I hope that style can work for TMNT too. And I disagree about a mandatory rating, I don't think it should be too violent and exclude children, there are going to be lots of 20somethings who would love to introduce their kids to the TMNT. this is AWESOME...I am very excited today, with this news, the Empire State Building and Tribeca stuff - all very energizing. whatever is done, it will be great to see another turtle movie. I do think the Snyder/PG-13 or higher ideas are good ones though;0)..but I know whatever you decide to do will be awesome. WHOO-HOO! I still liked the Imagi film-- and the animation. But CONGRATULATIONS! Good news indeed! 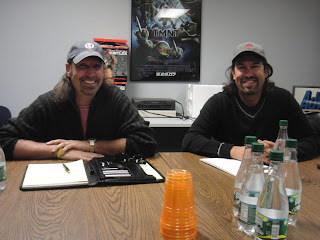 Scott and Galen look like twins. Do they have the same barber? PETER!!!!!!!!!! the minute i read this, i literally got up from my seat and shook my boss off of his seat and pronounced to everyone a new turtle movie was coming!. i work for a huge audiobook company and everyone knows how much of a fan i am here. i literally told everyone around the office the turtles are coming back. i can't even tell you how excited and how surprised i am about this news. it really makes me happy and gave me that funny feeling in my stomach like i use to get when i was a kid watching the turtle movies. i am so stoked about the possibilities of this film and the option a movie franchise that could happen. i love the turtles and for years have always admired the work done in the live action movies, i can tell you how happy i am for my four green brothers to come back on the scream after such a long time away. as i type this, i am already getting ready to leave and go get my michaelangelo costume ready for the big show out in New York today.. this has been the greatest news i have gotten all year!!!!!!! Please, Peter, we want to see real NINJA turtles, not a bunch of friendly guys eating pizzas!!! Another thing, lets make things right, offer a BETTER publicity for the film this time. I remember people that didn´t know about the TMNT film even when it was on theaters! Peter, is this film a continuation of the last one? The quote "focusing on the origins" makes me think of the JJ Abrams Star Trek reboot. The only thing that upsets me is the WAIT. Oh man, I am pumped! Seriously though, this is totaly hot news! Mind if I make an announcement about it on Secret Identity? Well two things...first, congratulations Peter! Second, to the non-believers that seemed to think the TMNT property was dying a slow death, I'm pretty sure a theatrical release guaruatees that isn't happening! Oh and another thing, I am SO HAPPY that they are using actual suits and not full CG, it will make the film so much more timeless and organic looking. If you look at any film that incorporates full CG the Star Wars prequels being good examples, it just feels odd even if they get it to look right, this is going to look so much better. I couldn't be more excited about this. so you casting for extras yet? Phenomenal news, I'm very excited about this already. Especially because there seems to be a point to look at the original comics as the source material. Something like a "Batman Begins"-style reboot is a great idea for the franchise, I think. I have to ask: What are the odds that the movie will get a higher-than-PG rating? An R-rated TMNT movie might be an unrealistic expectation, but a solid PG-13 would probably be necessary to really stay true to the comics' grittier, more violent roots. This is awesome! I can't wait for it! Also, I can't wait for the free comic book day in Rochester and it's cool to see TMNT 1 props are showing up much more than before. I must say that I am very excited for the turtles to be retuning to the big screen. This is great news Peter. However I am worried about big list actors voicing the turtles. I love the voice cast for the 4th movie. It was a perfect cast much like all of the turtles movies and cartoon series. It just wouldn't feel right to have A list actors voicing them. I know you guys will do a great job with it, I hope that it sticks as close to the original comics as possible. I know that an R Rated movie is out of the question but a PG-13 would be even better since you can get away with a lot more in the PG-13 movie now a days. Awesome news Peter. This is what TMNT fans have really been looking to hear. CGI to supplement the animated suits will be the best way to go. Just look at how Del Toro was able to combine the two for his Hellboy films. I'm glad to hear it will be based upon the first TMNT collected book. Those are excellent source material. Although I'm a little concerned that it will be too similar to the original TMNT film. 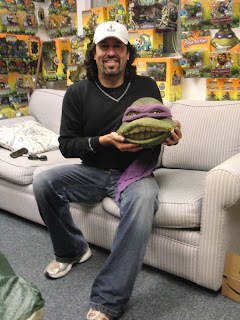 Peter you should consider Zak Snyder, should that be an option, because he IS a TMNT fan. Finally Peter listen to me here: Make this film PG-13 or DON'T MAKE IT AT ALL! All respectable comic films are PG-13 and this should be no different. AWESOME!! Amazing news, Peter! WOOHOO!! Man, couldn't get on until 10:00 to read this announcement, so I am only comment number 44. But still, it was worth the wait (I was expecting this since the foreshadowing post on Tuesday, but the news is equally exciting nonetheless). Great news! Is a PG-13 film a possibility this time around? Only reason I ask is that Kevin Monroe described difficulties with the PG rating and the Turtles not being able to fight like they did in the first film, which he regretted. wow just got back from the 25th anniversary screening of the movie. i had probably one of the most amazing times of my life. Ernie Reyes was there and i was so caught off guard. A genuine nice guy and Kevin Eastman was there too...such an unexpected day which i am so proud to have been part of. me and my gf both went and we really enjoyed the movie. i even took, ahem, brought home the giant sewer stickers laced around the streets by the turtle van! haha. such a great time... i liked your video message too Pete. awesome!!!!! A fun and different experience seeing the movie in the city it takes place in. -->> NEIL , DID YOU SEE ERNIE TOO >!? WHO DID YOU SEE >! ?>! I still do think that animation is the best way the Turtles can be expressed on film (of course as an animator I'm biased, hah), but I definitely am curious to see how well live action suits can be handled these days, and how the characters will be designed overall. Especially if face replacement enters the mix and looks good. Either way, it's Turtles and based on the comics, which I think are still deserving of a faithful adaption. I am hoping this one will be a little more witty and a little less silly than the original movie (which was still fun in its own right). And if Triceratons were to make an appearance, I think my life would be made. Thanks for the great news! Now to start waiting, I guess. Really great news! Hopefully the Jim Henson crew can return again. The turtles and Splinter looked so much better in the original film compared to 2 & 3. This is incredible news. I'm excited! I think this is going to be more along the lines of providing what the adult fans are looking for. I think people like Guillermo Del Toro have shown what can be really be done using "men in suits" in this day and age, taking a leaf out of his book could only serve to make a much better experience. ..and wouldn't it be cool if Zack Snyder got his hands on Directing it? Wishful thinking, sure... But we know he knows the original comics from interviews, we know that he know how to make comic-faithful movies, and to top it all, one of the producers produced one of his previous films. No matter who directs it though, im salivating. Glad to see this getting underway. Regarding the CG, that would be the best recourse, because we all know how expressive the turtles are, and while the animatronics were good back in the day, it was limited. Though when it comes to the big action scenes, full CGI models of the boys will be a must, because as buff as they are, they can move as lithe as Spider-Man when they really start to get into their groove. Can't wait. I think this is the best news I've heard all year, and it probably won't be topped. I think this movie could be the best opportunity to break the TMNT franchise away from the childish tone it's always been followed with. If it can stay close to the source material [the Mirage comics from olden times], then this movie could easily bring the Turtles back in a major way. People respond well to grittiness. Look at The Dark Knight, Hellboy as well. So long as the Turtles are taken a little more serious, this could very well be a blockbuster! Good luck with the making of this movie and I hope its success will match the quality that I know will excel. Remember me??? The one that has waited for your answer over 700 days. Finally, you have given me the final answer. That's great news. I hope it's a huge success! Shortly after the first movie came out, I started buying both the Archie comics and the Mirage Studios comics, and I saw right away what a difference there was between the two types of comics, plus the TV series. The TV series was full of utterly idiotic premises that totally fouled up the personalities of the characters and made the whole "pizza" thing a joke that irritated me. Mirage Stuidos, on the other hand, had things like the powerful images in the "Leech" story, the creation of the characters Radical and Lucindra, the evolution of the family after their defeat by the Shredder, all those things that can't be described properly in a kiddy show. And that's exactly what the first three movies were. They lost the hard, gritty edge, the passion, the anger and spirit, of the Mirage Studios comics. Yes, I know. The TMNT started out as a joke, a parody of another comic book series. Nobody was expecting them to take off like they did. But what happened? The stories got better and better. People *liked* the hard edge and the harsh feelings of the Mirage comics, and meanwhile we were spoon-feeding our kids the silly pizza-enhanced versions on TV. By the second live-action movie, reviewers were complaining that the characters had lost all personality variations and were just one-like-the-other. The stories were *dumbed down* for kiddy viewing. This CGI version saved the day by being true to the spirit of the original comic book series, while managing to stay "kid friendly" because of the wonders of cartoon technology. A cartoon isn't real life, so throwing people out a window (like the monster did in the beginning) might kill them, but it's the kind of bloodless death that kids can differentiate from reality, while letting the adults see the true spirit of the turtles. You stick people in suits, even if they've got CGI faces, and you get an instant, automatic "dumbing down" again. No blood can be spilled, so is Leo going to lose his swords again, like he did in the second movie? Are we going to be treated to another white rapper singing a TMNT song? Heck no - not when Eminen is the only white rapper around these days. Like they're going to risk putting *him* in. We're going to end up with the same gooey baby slag that the first three movies vomited up on the screen, and all this after following the awesomeness that was the 2007 CGI movie. I am *so* not happy. This is great! Another Turtles film!? I can't wait to see how Shredder will look like! Secret of the Ooze: Loved it as a kid. But today... Leo ditches the swords, Raph ditches the sais... They fight with toys and environments... It's as if Batman was played by Jackie Chan. Vanilla Ice was a nice cameo back then. But this movie strayed too far away from what the turtles are. Even farther than the 80's cartoon. TMNT III: Some say it was the worst movie. I beg to differ. While the whole time-space-travel was irrelevant, the enemies were generic, etc. There was enough action involving weapons to be satisfied. Perhaps a little more sword-clashing would've been good. But most of all, it lacked a really good villain. And please, even Shogun would've fit perfectly in this film. Michaelangelo even gave a false hint (referring to a TV Series), but it still was the name of a TMNT villain. TMNT (2007): Good action, great character development. Awful 3D models for humans. April O Neil looks anorexic. Most human characters are completely disproportional. Sure, it's cartoony, but even 2D cartoons do better than this. Plot was... meh... But again, action and CharDev. were outstanding! Good luck with the new movie! I'll definitely go watch it! The 80's cartoon got me into TMNT. Even if it was not exactly what you wanted it to be, it still led me to get to know how the original work was. -->> Damm good insight , Diego !! THIS IS SO TOTALLY AWESOME!!!!!!!!!!!!!!!!!!!!!!!!!!!!!!!!!!!!! I LOVE the Turtles!!!!!! I can NOT believe that this is happening! My brother and I are SOOOOOOOOOOOOOO excited!!!!!!!!!!!!! I swear to God, if Micheal Bay butchers this like he did to Transformers, I'm going to lose it. I don't care how much money he's brought in for his movies. If he ruins this, there's goign to be legions of unhappy Turtle fans at his front door with torches and pitchforks, ropes and horses, tar and feathers and other unhappy things. A new fun online bet is available for you to challenge. Because of the web casino. Our gambling club is focused on providing online gambling services that are so comfortable that it makes gambling websites. Our Online Casino is open 24 hours a day. Players can play all the online gambling games at any time and important. G-Club Website Our online casino also has a very effective team to help you every time a player comes to the service on the site. Our online casino.